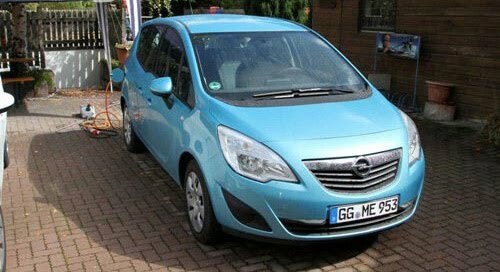 The two plug-in Merivas spied during a charging cycle last week, prompted internet speculation that GM/Vauxhall/Opel is working on a fully electric version of its mini-MPV. But a Vauxhall spokesman insisted, “This car does not indicate that we’re considering building a hybrid or electric powertrain for the Meriva.” Instead, the cars are believed to be part of Opel’s role within MeRegio (Minimum Emission Region), a research project that involves seven other partners including Bosch, Daimler (through the Smart brand) and data management firm SAP. It’s designed to integrate the next generation of electric vehicles into the network, intelligently managing load and charging phases, feeding back energy into the grid where required (and crediting the car user with this), and facilitating cross-border roaming standards. The project also aims to establish up to 600 private, commercial and public charging points in Baden-Württemberg. Several manufacturers, including BMW with its Mini E, have identified power network integration as an area of potential problems and benefits for electric vehicle users. More details of Opel’s involvement are expected this autumn. It’s still unclear if the manufacturer’s input will extend to a fleet of trial vehicles, a policy that has been adopted by several motoring manufacturers.